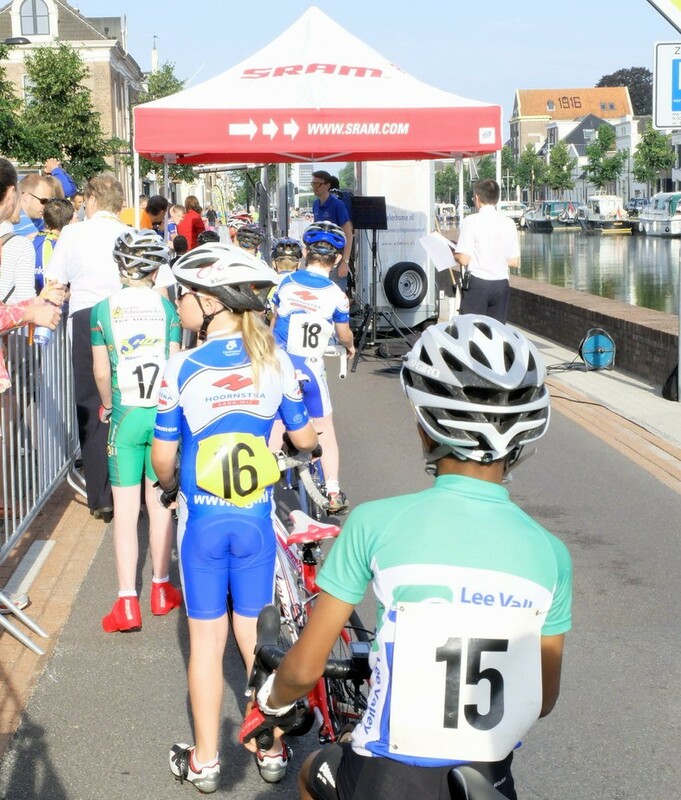 When CJ asked if he could try his wheel at the European Junior Cycling Tour of Assen, I guessed that at least I would see if this was the sport he wanted for himself as a six day Tour would be tough considering he would be lucky to race once a week in the UK. Anyway, cycling is already starting to consume my life as I knew it, so what was another adventure to indulge in. Plus, when he said he would rather race than meet Mickey at Disneyland as that was kids stuff, you have to wonder what drives these young road racers. 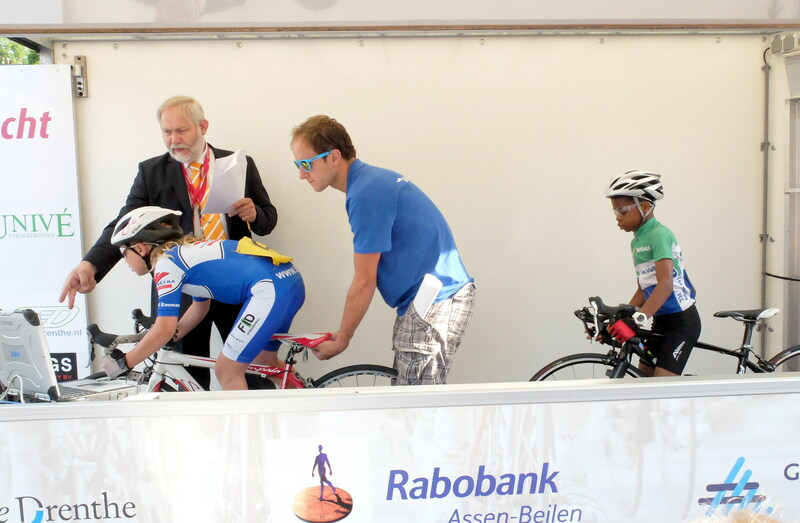 Well, the Tour of Assen was about as deep in the sections as we could find ourselves in such a short time, especially with it being the only UCI sanctioned youth race. The quality of the field was also expected to be of the highest calibre so CJ wanted to test his mettle and also the Dutch organisation of the event is well spoken about in youth circles. Past participants include the likes of Dutch Olympic 2012 Road Race winner Marianne Vos, therefore it was a ferry departing from Harwich and a two and a half hour drive from the Hook of Holland to find out what the fuss was all about. 35 racers were in Category II (boys born 2004/girls born 2003) and CJ was given bib number 15 at registration the day before so would be the twenty first rider off the start ramp in reverse order. 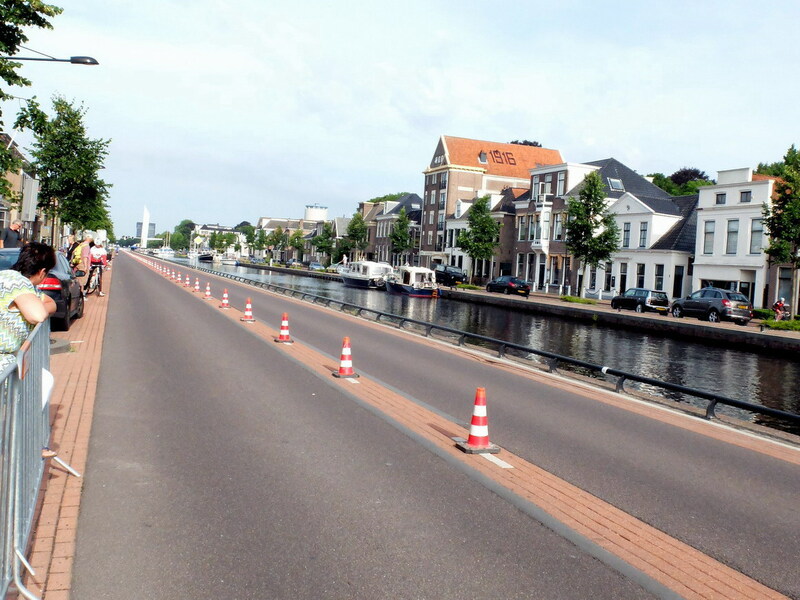 The one kilometre prologue along the beautiful canal op de rijbaan van de Vaart ZuidZijde looked idyllic with vintage barge boats afloat but cycling drama was the order of the day in postcard heaven. Just like the pro’s CJ’s name was called up and he signed on before having his gearing checked and then held for the start ramp… Half a kilometre along the canal with a sharp u-turn and a fight back to the line was awaiting and with a near 8.30 a.m. start, his body was also in for an early morning shock as he yawned whilst waiting. He kicked his sprint hard of the ramp and was soon out of sight as he hurtled down the canal now a dot in the distance. Following the u-turn he soon started to come back into view and I shouted him back pass me as he took the line with a 1:47.870 coming from his transponder. The information was relayed over the tannoy in seconds as each racer left one minute apart. I thought the time was reasonable until I heard a 1:40 coming from the announcer moments later. Ben Askey (Lichfield City CC) soon had his time bellowed out as a 1:44.600. 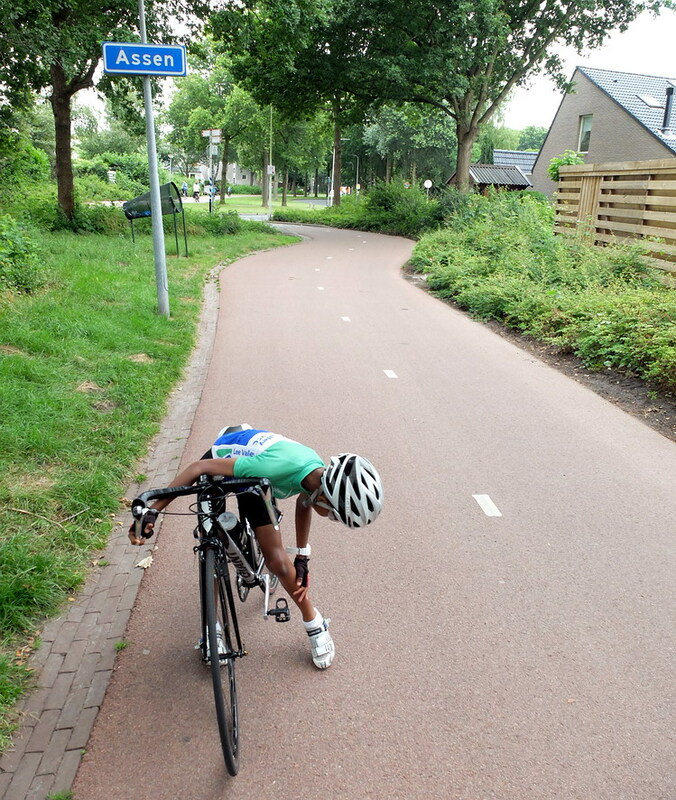 Yep, it was going to be a tough week in the saddle. Soon the time sheets were out and CJ took 15th place. He was reasonably pleased to be in the top end of the field as the competition looked intimidating to say the least with full sponsored teams and coaches in attendance shouting their riders on… These were near pro’ looking crews from where we track stand and operate in the UK with bank sponsorship and cycling shop affiliations. The cycling boom in the UK and associated monies from big business and the Lottery is obvioulsy not getting to grass roots racing. This was the deep end of how to operate and run youth racing and Disneyland was now looking an easier option. 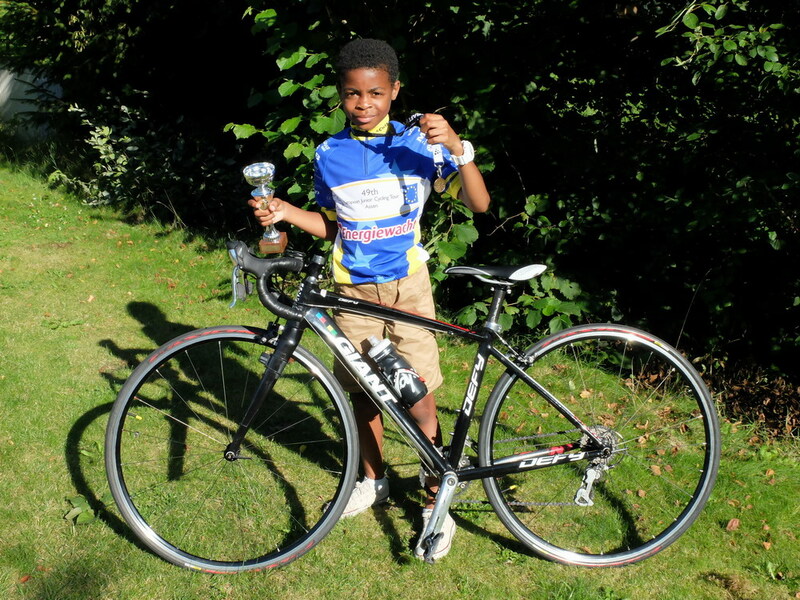 Alexi Edwards from Welwyn Wheelers commented to CJ that a 15th was good for this stage of the Tour, but he barely heard him as he took in the enormity of the week ahead. At last there was a race to be had after travelling hundreds of miles for a one kilometre dash. 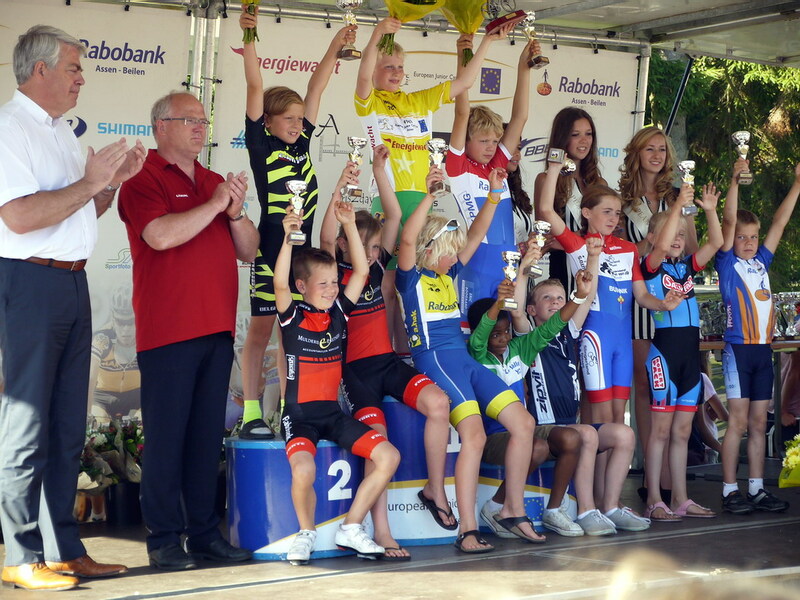 Central Assen was the Criterium location for the four laps each of 1.8 kilometres with two sprints for time points. The racers looked agitated as it was now at last time to spar and they quickly bunched up for gear checking only to be held and then randomly selected and sent to a holding area near the start line. CJ had a front row position though on the edge of the road so not ideal along with having Ben Askey on his shoulder to boot. The start line official reeled off with some rules in Dutch and before he knew it a bell was rung and it was time to stick and move, stick and move. CJ hit a quick sprint to get back to the leaders and coming into view after lap one he was in the main group of about 20. 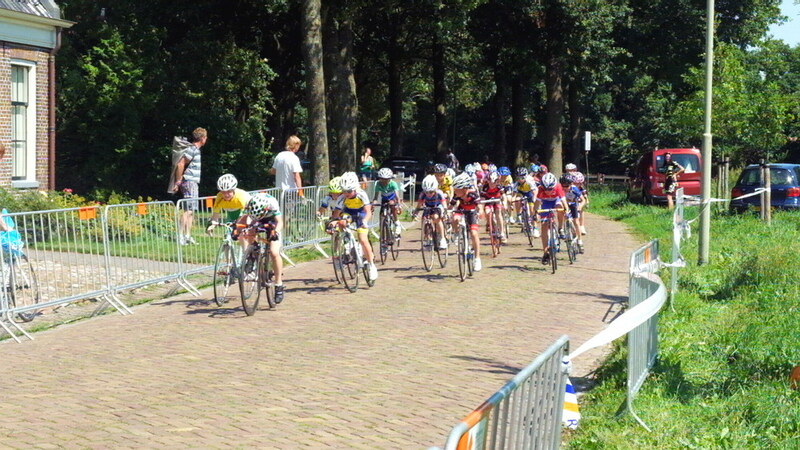 The pace was fast as they were taking no prisoners and releasing no hostages in this War of the Pedals. We were forewarned that the races hit high intensity from the drop but I wondered if they thought it was a one lap special as they came past smoking. CJ contested none of the sprints and just adjusted himself to the pace, but so far he was not looking too troubled considering three National Champions were in attendance. The bell sounded for one lap to go and CJ came past in about 15th position… It was all now down to his resolve to fight for space in the front group. The final corner saw him in about the same position as he was boxed in on the turn until he launched his sprint down the straight taking seven positions and finishing 8th in his first European road race. The win was taken by the Dutch National Champion with CJ a not too shabby three seconds of the winning time, so pleased with the result as well as the experience, which he said was the most exciting of his short ‘career’ thus far. 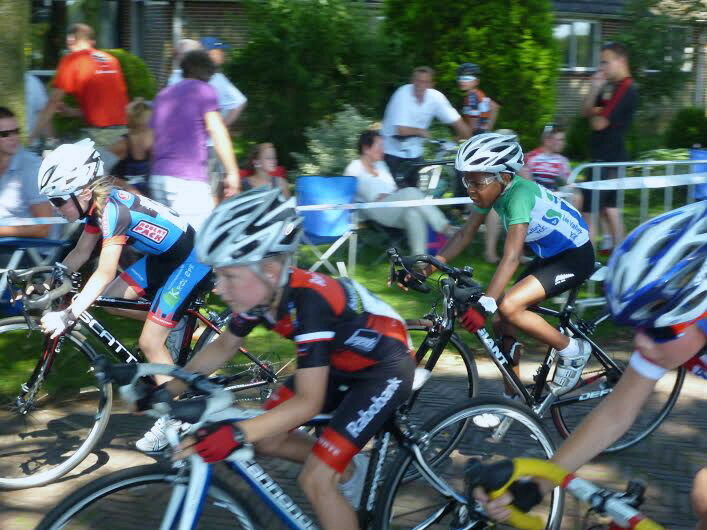 At last Caelan was going to emulate one of his hero’s Fabian Cancelara and ride a race on the cobbles. 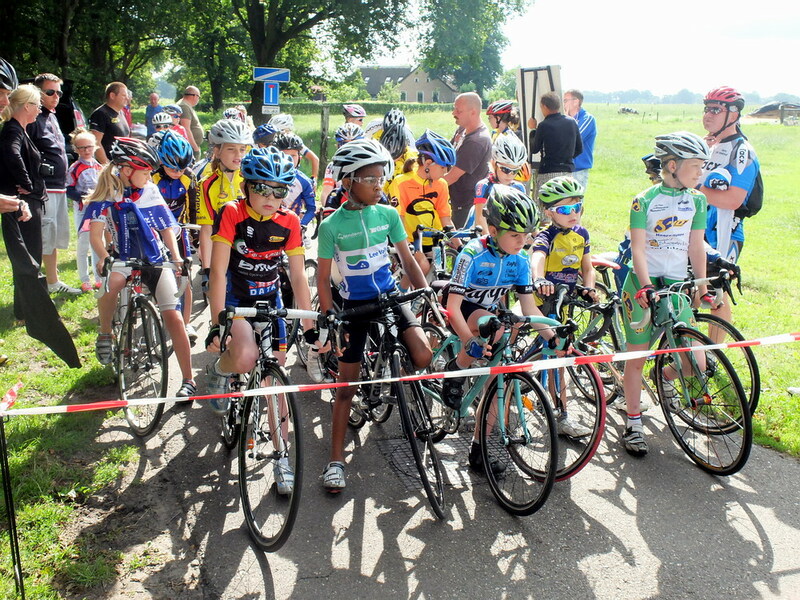 The start was at Deurze Berkersweg and would finish at the stadium Wielerhome Stadsbroek where registration took place. The time on the road was estimated at 20 minutes and we would have to take an alternate route back to the finish as a full police cavalcade would be in attendance as they raced the various surfaces. A marked pace car gave the racers a rolling start before pulling off with the riders now in full pursuit. Sadly we returned to the stadium car park only to see the back end of the group enter the arena and after rushing in we thankfully saw CJ near the entrance. I shouted to ask his placing and he responded with a tentative sixth position. 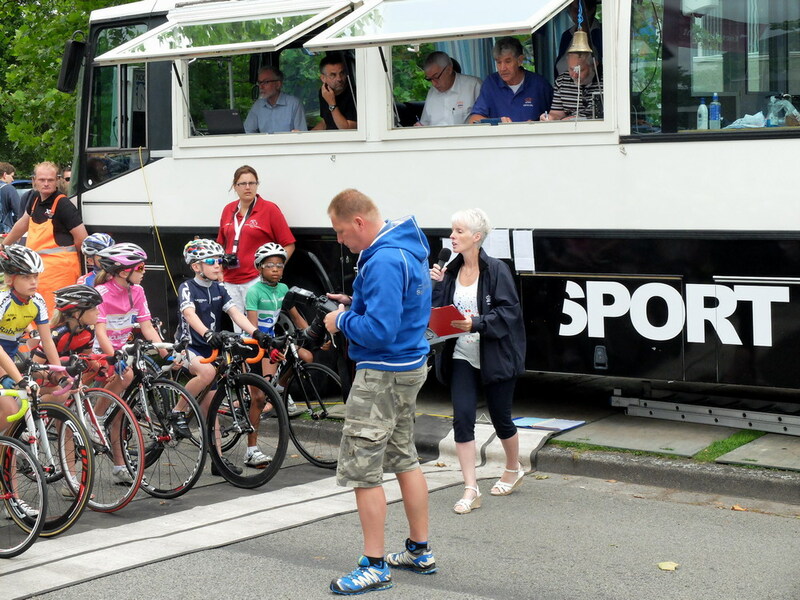 Other UK riders and parents informed us the sprint to the finish had the commentator in a frenzy shouting “sprinten – sprinten – sprinten” with the racers in the front group battling for positions and time points for the top ten. Again within minutes the positions were confirmed and he had taken sixth and with the top seven being given medals he was over the moon for now. The next day would bring a 2.5km individual time trial and he didn’t want to lose too much time as from Monday’s outing we knew it wouldn’t be his strongest event. Alas, unlike the Prologue, this one could affect his position in the overall General Classification which we had decided to avoid viewing as we just wanted CJ to race and enjoy himself without the added pressure in his rookie outing. CJ’s starting time was noted as 10.34 a.m. and racers from all categories were leaving one minute apart just a stones throw from the famous Assen GP circuit. Another quick gear check was completed and he was then held for a few minutes before dropping down the start ramp and attacking the course. With just about a kilometre to go he came back into view from the loop and looked to be pushing too strong a gear as he finished his first tour individual time trial. Within 30 minutes he was given 13th position with a time of 4:47.800. This was not ideal but being only within one second of the top ten, he hopefully would not lose too much time in the overall General Classification. It was always apparent that his T.T. training needed working on as regards his positioning on the bike but now it was really highlighted. 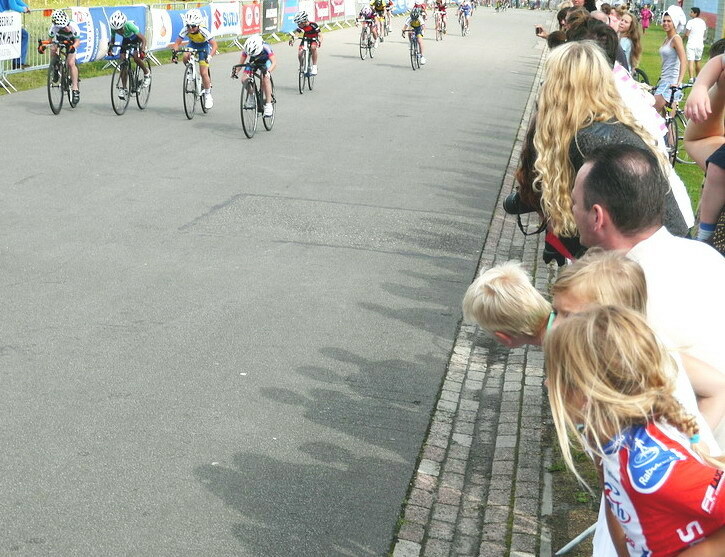 A near 30 minute drive took us out to Grensweg and what appeared to be the most difficult stage on the Tour. Two laps totaling 5 kilometres awaited and now the cobbles were larger and the circuit route very narrow in places. Caelan was gridded in the centre of the pack and the 20 minute wait was stressful for the racers as the temperate was now a ridiculous 30+ degrees. Again under a rolling pace car start Caelan pushed his way into the lead group and was soon going hard on the cobbled section. He stated that due to the lack of space there was fighting in the lead group of about 15 racers as the rest got dropped off. Also, chances were being taken on the tight corners with pedals nearly touching down and within the 1st lap a rider was soon down and taken to the medical centre badly hurt. 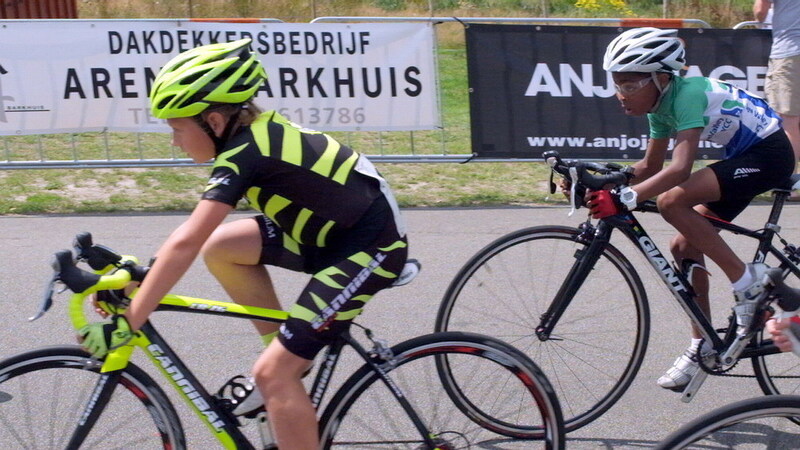 CJ hovered in the top ten taking 8th in the intermediate sprint but on the finishing straight looked out of sorts as he cruised in taking 9th place and only losing time to the winner, the Dutch National girls champion so not much damage done. He later told us that races back home did not prepare him for riding in such large fast groups and was glad to get out of the place in one piece as the casualty rate on the day was high. 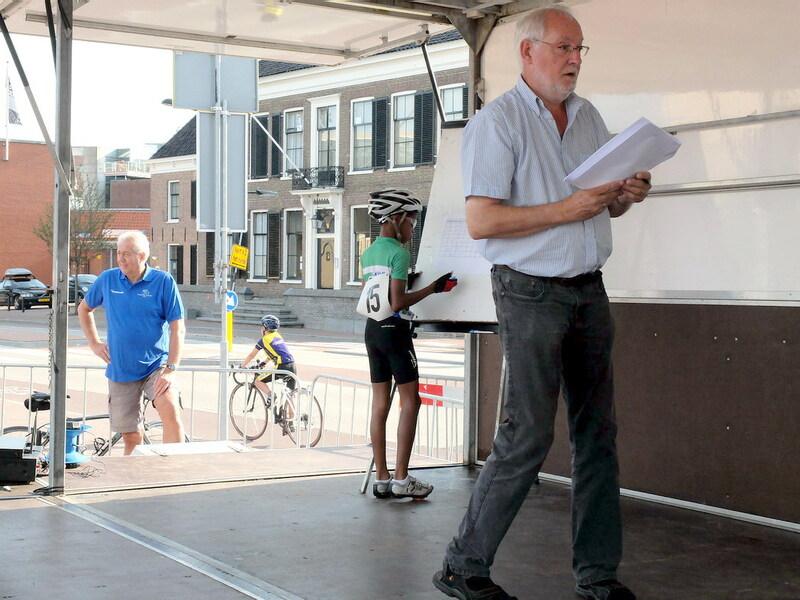 This Criterium was going to start as well as finish within the stadium Wielerhome Stadsbroek, and as Wednesday’s Klassieker Door Drenthe saw CJ take sixth position up the same final straight he was looking forward to the stage. Two 3.8 kilometre laps with one sprint was the order of the day and after gear checking the racers were pounded together just outside the stadium awaiting the pace car that would take them to a rolling start in the arena. CJ was gridded on the third row so would have to fight to get to the front once the race started and that he did swiftly as when they left the stadium into the wooded area of Asserbos he had made his way to fourth place. Within a couple of hours the presentation ceremony was held and CJ took a trophy for being placed in the top ten as well as a commemorative Assen shirt for the 49th event. Yes, we made mistakes along the way but I’m told it takes a few years to crack this Tour so all in things went reasonably well. Closure: When asked if he would do the event again CJ replied a most definite ‘yes’ and as next year will be the 50th anniversary, we were informed that it would be special. To be honest how they could better it is beyond thought as the whole thing ran so smoothly from our point of view and we cannot even remember seeing a puncture throughout the whole event. A sincere thank you to the organisers and volunteers who make this great Tour a reality for all the youths that take part. Also, a shout out to all the UK teams that cross the waters and give our European counterparts hard competition. Paul, this is brilliant I’ve been reading with interest seeing CJs progress, he’s doing amazingly well. I’ll be routing for him so keep up the reporting (and the pictures aren’t bad!). Absolutely great read, and gave me a great insight in what to expect, my son rides in the same age category as your lad Caelan, he finished 2nd in the National Youth Series this year,we are considering doing Assen 2015. Brilliant riding CJ. Ben Swift and Adam Blyth rode that tour too. Great write up as well. Well done. Thanks Andrea and we will return later this month after a two year hiatus and he still has your image.